A 36 year old woman named Erica Morales (pictured) died hours after giving birth on Thursday Jan. 15th to quadruplets in a Phoenix hospital. 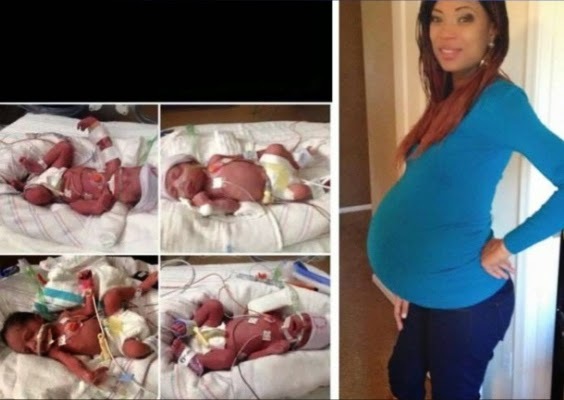 Erica Morales was about seven months pregnant when she delivered the babies — three girls and a boy — at Banner Good Samaritan hospital, Nicole Todman, a family friend, told the news organization. But she died before ever getting a chance to see the babies she and her husband had long hoped for, Todman said. Morales initially went to the hospital for high blood pressure, according to Todman, who added she was unsure of how exactly her friend died. The hospital would not provide that information, the AP reported. In the wake of Morales’ death, Todman has started a GoFundMe to raise money for the family. She said on the page that Morales and her husband, Carlos, had tried for year to have a baby. Morales finally became pregnant last year with the help of doctors. All donations would go “to provide for the beautiful babies Erica fought so hard to have and in the end gave her life for,” she wrote. As of early Saturday afternoon — less than 24 hours after the page had been created — hundreds of people have rallied behind the family, donating more than $18,000.